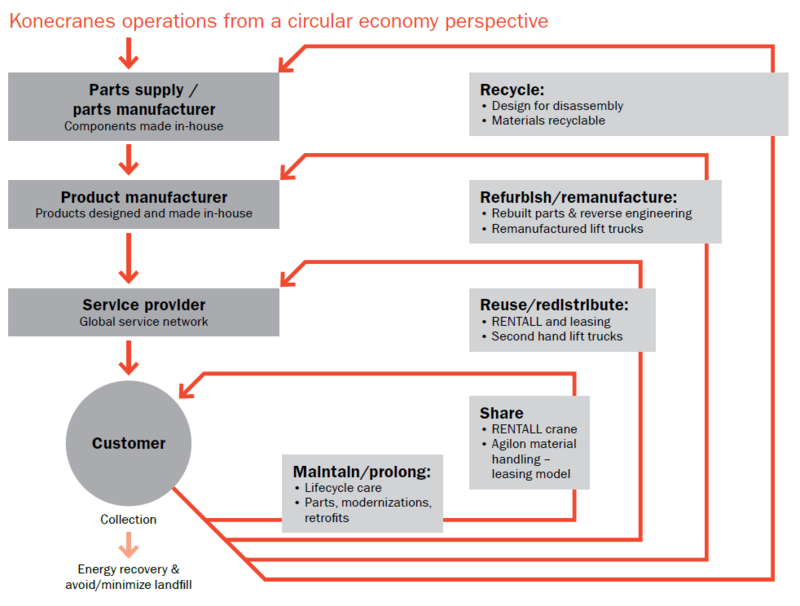 We see advantages in circular economy business models. Growing interest towards rental services and product-as-a-service offerings as well as the demand for low-carbon products indicate that markets are seeking new ways to do business that are cost-efficient and sustainable. Significant savings can be obtained through renting, repairing, modernizing, reusing, and recycling our products. We aspire to stimulate greater change through a sustainable and innovative offering that harnesses the potential of circularity and digitalization. Circular economy creates value by minimizing waste, energy and the use of natural resources and decoupling value creation from resource consumption by slowing, closing and narrowing loops of material and energy. We see a great deal of potential in the interplay between digitalization and the circular economy. We offer advanced tools that take advantage of digitalization to improve the productivity, serviceability and lifetime of equipment. Our solutions include long-lasting design, design for easy maintainability and disassembly, repair and refurbishing, reuse, remanufacturing and recycling. We help our customers to develop world-class operational performance by optimizing their material handling flows and by making intelligent and connected lifting devices. Our Lifecycle Care in Real Time approach is our comprehensive, systematic approach to lifting equipment maintenance. It harnesses the industrial internet to connect data, machines and people to provide the right service at the right time. IoT and intelligent assets we use can sense, communicate, and store information about themselves creating products that can signal any problem, determine when need to be repaired, and schedule their own maintenance. The objective is to reduce unplanned downtime while increasing equipment safety, productivity and lifecycle value. Digitalization improves predictive maintenance by providing accurate information on the availability, location and condition of equipment. We are developing our service business to enhance its ability to maximize the lifecycle value of products. Our products can be remanufactured and modernized to extend their lifespan and can be reused, and then finally recycled at the end of their lifespans. Modernizations and retrofits save a great deal of resources by reducing the environmental impact of product lifecycles, saving raw materials and enhancing equipment energy efficiency and performance. Additionally, modernization increases safety, productivity, reliability and usability while decreasing the need for repairs and unscheduled maintenance. There will also be more technical and spare part support for the modernized crane. The use phases of our products can extend for decades, so by investing in smart and connected, resource- and energy-efficient products, customers can achieve significant reductions in their environmental impacts. Circular economy business models also help us raise our resource and energy efficiency while reducing our customers’ environmental footprints. In order to gain maximum circular value from our products, we focus on providing maintenance to keep our products in service longer, extending product lifecycles and utilizing the Design for Environment concept (DfE), including the reuse and recyclability of products, in product development. Core of Lifting: We develop our products’ key components in-house, starting from the design and material selection phases. By constantly seeking new combinations of raw materials and components, developing smart features, and finding ways to improve energy efficiency we can reduce the environmental impact of our products’ life cycles. Lifecycle Care: Our vast service and spare part offering and systematic approach to maintenance is supported by digital tools that allow real-time visibility. This helps predict failures and maximize the productivity of the equipment’s uptime, thus also making it possible for our products to stay in use longer. Extending products’ lifecycles: We further prolong the service life of equipment through retrofitting, remanufacturing and modernization. Reuse and recyclability: We select repairable and recyclable materials for our products and design our equipment to enable their reuse and recycling. In addition, we encourage the re-utilization of pre-owned equipment. We also offer crane rental services, which include comprehensive service and preventive maintenance, allowing customers flexible production at a fixed monthly cost. In order to achieve significant improvements in environmental performance, we take environmental considerations into account for the entire lifecycle of our products. Usability, eco-efficiency, and safety are our guiding principles in product design, along with lifecycle thinking. In our conjoined product offering we can provide innovative power options such as hybrid and battery technology and other energy saving solutions such as regenerative braking. One good example of circular economy is our Agilon product and service concept. By selling material handling as a service, we are able to work in close co-operation with our customers, which improves understanding of the customer's situation and our ability to cater to the needs of the customers in changing environments. The remote control of the system reduces logistical needs: the required service can be identified without needing to visit the site. This reduces the environmental impact of the operations. The system is made up of modules so it can be reused. It is also set up based on customer needs and can be expanded if needed.